+$Take a trip to the wizarding world with this series of illustrated posters inspired by Fantastic Beasts and Where to Find Them. +$As any fan of the Harry Potter series knows, there's more to the world around you than meets the eye. From secret train stations to hidden alleyways filled with magical goods, the wizarding world is packed with treasures waiting to be discovered. And thanks to the release of Fantastic Beasts and Where to Find Them, we now know there are magical critters roaming among us. +$To tie into the release of the latest wizarding film from the pen of J. K. Rowling,+$Skyes Cottages与...合作NeoMam工作室+$to create this series of beautifully illustrated travel posters. Inspired by复古海报+$of mythical creatures such as the Loch Ness monster, these illustrations depict some of the main critters from Fantastic Beasts and Where to Find Them. 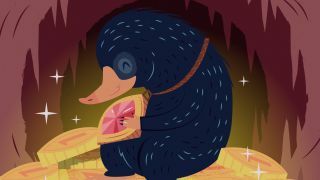 +$As well as the cute Niffler and the impressive Thunderbird, there are also creatures from the Harry Potter series, such as Merepeople and Giants. "Once the posters were ready, we shared them on Reddit with the r/harrypotter/ community," says Gisele Navarro from NeoMam Studios. "They were super excited and even mentioned other creatures they'd like to see. They also mentioned they would love to hang the posters on their walls and that's why we created print-ready downloadable versions."